Aogashima is an isolated island contrast to the natural beauty which is reachable from Tokyo. It is situated 400 km away from Tokyo and mainland Japan. It is the home for different wild birds in huge number located in the Kuroshio region of open seas and known for tidal wave generation. To reach the island from Tokyo you can take either boat or plane to Hachijojim, and then catch a boat or helicopter for Aogashima. The daily boat is cancelled more than 50% of the time, because of the rough sea around Aogashima so helicopter would be the other option which is more convenient. The geography of the island makes it stunning- an extinct volcano rising out of the Pacific covered in thick lavish vegetation and a volcano within a volcano. The few inhabitants live outside the bowl, at the North end. It takes about 45 minutes to reach the top walking and the view from there is spectacular. You can also walk across the middle and through a tunnel to the South coast. Aogashima has a humid climate under the effect of the Kuroshio warm current. The last known volcanic eruption of Aogashima was in the late 18thcentury. Aogashima is considered a Class-C active volcano. Aogashima is the smallest village in Japan. As in 2009, the island’s population was 205 and it’s decreasing every year. Aogashima’s outer rim height ranges from 200 m to 420 m in height. The island was formed by the corresponding fragments of at least four underwater calderas. Aogashima consists of the rims of the inner and outer craters. Sothern coast rises to a sharp rim forming one edge of a caldera called Ikenosawa having a diameter of 1.5 km. The caldera is occupied by a secondary cone named Maruyama, which still releases geothermal steam around an area where no plants are evident. 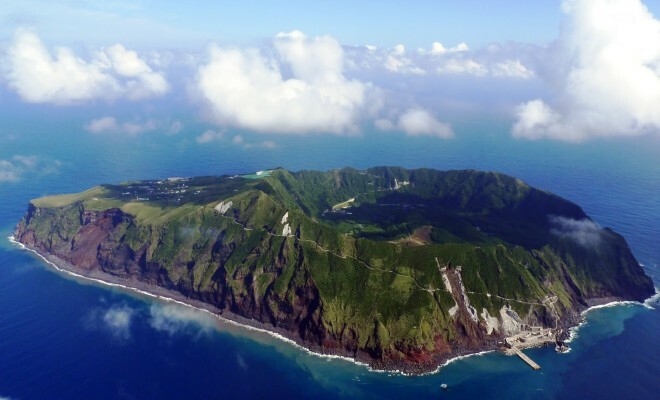 Otonbu is a composite volcano, which is the peak of the rim of the outer crater at a height of 432 meters above sea level, is also the highest spot in the island. It commands a panoramic view of the entire volcano in the Pacific Ocean. Fureai Sauna is a public facility consuming geothermal power and gas, features a sauna, a public bath, hot showers, a social lounge and a cooking furnace. Cooking eggs on the furnace is another attraction in the island. This cooker using geothermal steam is accessible for free. Hingya Salt consists of many volcanic blowholes called “hingya” in the local language of the island. It is used by the villagers to make salt by heating the seawater from the Kuroshio Current using the steam. The salt is very rich in calcium and is one of the popular souvenirs. The place is known to very few people so tourists are a rarity in the island. Local hotels will have accommodation provided to the tourists. There is a sauna working on the geothermal energy of the volcano with public bath, hot showers and a pub nearby. The island has no real harbor to anchor boats because of the steep rough cliffs of volcanic deposits around the entire island. Before boats were the only medium to reach the island but then helicopter service was launched in 1993. The helicopter functions once a day and carries a maximum of 9 passengers. Many of the time the helicopter service gets cancelled due to heavy fog. This is why Aogashima is still a rarely-visited island. The island itself is a giant volcanic crater, and within that crater there’s another, smaller volcano. You can go camping by the volcano surrounded by the volcanic hot springs on the island where you can sense the isolation and simplicity.